Since I couldn't get (even rewinding several times) what kind of smoked fish they used, I decided to skip it. Cheese doesn't belong anywhere near a delicate white fish, in my opinion, so the Tallegio was omitted. Sea bream to me is a fairly bland and characterless white fish, that is moderately firm in texture but not as nice as cod, but not meltingly soft like flounder. In other words, a good mid-ground all-rounder. It's likely that only British people have any affinity to fish pie. Traditionally, it's made with either just fresh fish or both fresh and smoked fish in a creamy sauce, topped with mashed potato. (One of the contestants did make a fish pie, but hers looked like a traditonal one.) Mine has twist in that the fish is cooked in a mild tomato-cream sauce that is flavored with saffron. The saffron flavor is quite subtle but (to borrow the words of Rachel Ray) it makes you say "Hmm? What is that?". My inspiration for this came from the saffron in a bouillabaise. The key to this dish is to cook the fish as briefly as you can manage to. This means just putting the chunks into the hot sauce right before you put it into the oven dish. Also, the mashed potato part should ideally be very creamy and free of lumps - and you will add a rather scary amount of butter and creme fraiche to it. The creme fraiche adds just enough of a sour undertone to make the potatoes interesting, and matches the sour note in the tomato-cream sauce. 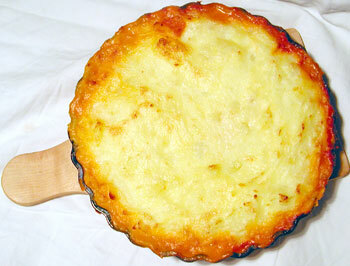 The picture shows an individual size (about 15cm / 6 inch diameter) pie dish. For a complete dinner, I would serve the purple sprouting broccoli (or indeed, just plain broccoli) steamed or boiled and chopped on the side. Makes 2 servings. Preheat the oven to 200°C / 400°F before commencing. Peel and cut up the potatoes into small pieces, and bring to a boil from cold water with a little salt added. Cook until the potato is tender. Drain the potatoes, and return them to the pan and shake until all moisture is gone and the whole is floury and falling apart. Mash finely with a masher, or pass through a potato ricer. Heat up the milk and butter in a separate pan. Add to the potato mash and whip. Stir in the creme fraiche and whip to a smooth consistency. Season to taste. Mince the onion finely, and sauté until limp and transparent in a little butter or olive oil. Add the tomato puree and simmer. Soak the saffron threads in a little water. Add the whole to the sauce. After the sauce has simmered for about 15 minutes, add the cream. Season to taste, then add the fish chunks and immediately take off the heat. To assemble the pie: put the fish-sauce mixture in the bottom of a pie or casserole plate, about 1/2 up. Put blobs of the mashed potato mixture on top, and carefully smooth out with a spatula, trying not to disturb the sauce underneath. If you want to go all out, dot with tiny bits of butter. Submitted by maki on 2006-02-02 13:22. I was the contestant who cooked fishpie on Masterchef! The smoked fish was a pair of Arbroath Smokies and I'm regretting using that damn taleggio to this day !! Keren, just by participating on the show you showed tremendous courage! I am not sure I'd have the um, balls for it. :) Congratulations for getting to the prelimaries!